We know many of our customers run mission-critical infrastructure and deeply care about the performance and health of their applications. That's why we've formed a partnership with Raintank on a brand new Grafana app for displaying and monitoring all of your NS1 data. Grafana is a widely used open-source platform designed for visualizing time series data and consolidating data into a single dashboard. 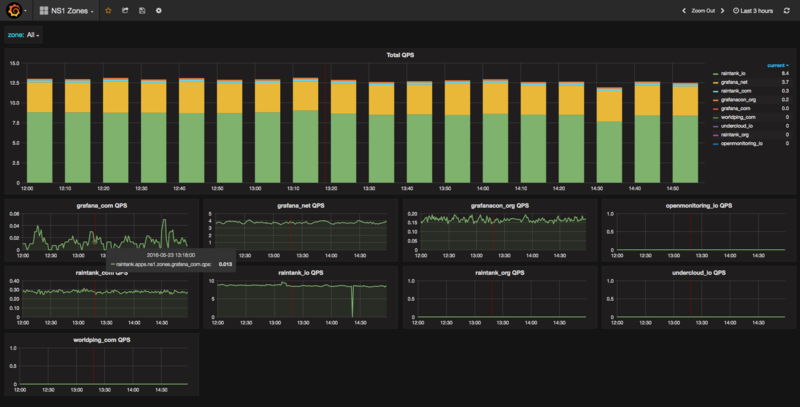 Grafana is super flexible and can be used for Internet infrastructure, application analytics, home automation, weather, process control, and almost anything else you can imagine. Many of our customers rely on Grafana and even our NOC uses it to monitor our network performance. To give more of our users access to this powerful solution, we've teamed up with raintank (the company behind Grafana) to develop a Grafana-based NS1 app that provides real-time and historic visibility into DNS traffic and our high-frequency monitoring tool. The app is completely free and can be configured in just seconds using Grafana's plugin platform. Once enabled, the app will generate beautiful dashboards to visualize your NS1 data. Then use Grafana's powerful graphs to dig into traffic spikes or become instantly alerted of a tripped monitor. When combined with other infrastructure and network data you'll have a complete bird's eye view into what's going on with your application. The NS1 app requires a Grafana.net account, Grafana 3.0 (or higher) and an NS1 account. There are no other external dependencies, accounts or configurations needed. Full installation instructions are available now on Grafana.net. As always, we're committed to improving and adding new features. Have feedback for us? Just get in touch with us here, and let us know what you'd like to see in future versions.